Vietnam and Indonesia should step up their cooperative efforts in order meet the bilateral trade target of US$10 billion by 2020, Vietnamese Minister of Industry and Trade Tran Tuan Anh informed his Indonesia counterpart Enggartiasto Lukita. 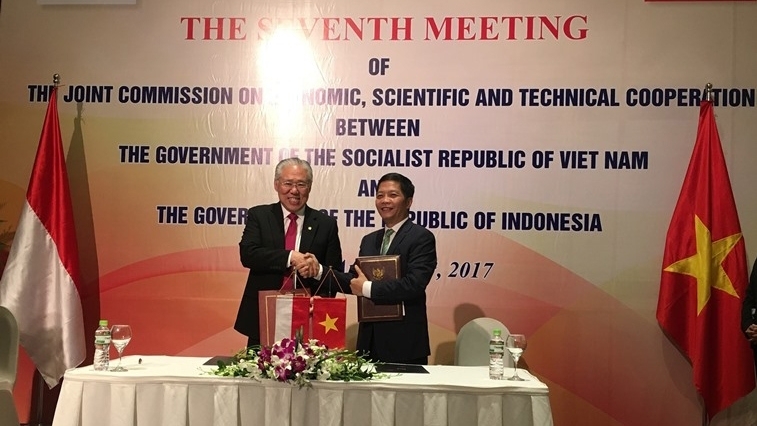 The two ministers discussed the matter on August 12 at the 7th meeting of the Joint Committee on Economic, Scientific and Technological Cooperation between Vietnam and Indonesia. Anh said that trade between the two countries reached US$5.6 billion in 2016, with the growth rate during the 2012-2016 period averaging 5% per year. However in order to meet the US$10 billion target, more efforts from both countries are needed. He elaborated that the two sides should continue fine-tuning the legal frameworks for cooperation, minimise trade defence measures, establish a mechanism to share information and experience and increase trade, investment and tourism promotion, among others. Minister Anh expects Indonesia to consider relaxing the regulations on steel imports to facilitate Vietnamese exporters, as well as prioritising the purchase of Vietnamese rice when it has a demand. Concerning energy cooperation, the Vietnamese minister expressed his desire that both sides will create favourable conditions for enterprises in the fields of oil, gas and coal to implement cooperative activities. Anh also suggested that the relevant authorities of Vietnam and Indonesia work together on opening direct flights between Hanoi and Jakarta by 2020. For his part, Indonesian Trade Minister Enggartiasto Lukita hopes that Vietnam will support and facilitate Indonesian investors in Vietnam, in addition to asking Vietnam to cooperate in developing the pepper industry, especially white pepper, and provide information on Vietnam’s tobacco import management policy. Indonesia is currently Vietnam’s fourth largest trade partner in ASEAN. Last year Vietnam exported US$2.6 billion worth of goods to Indonesia and imported US$3 billion. Head Office: 10-11th floors, the Ministry of Industry and Trade's office building, 655 Pham Van Dong Street, Bac Tu Liem District, Hanoi.